Mix all ingredients together and add enough juice to make pancake consistency. Cook on your cook top in a frying pan as you would with “regular” pancakes. Cooking these baby cereal pancakes on a griddle will work better as you will have more control over the temperature and will be better able to keep the temp. at a constant heat. I used whole wheat flour, and added a tablespoon of baking powder to fluff the pancakes up a bit more. I used mashed banana, which I don’t think I’d use again. I found wetter spots in a couple of the pancakes from where there was a little banana clump. Next time, I’d either puree the banana first, or swap it for something like blueberries, or maybe some applesauce. I also used 1 cup of oat baby cereal, as that’s what I had on hand. My darling little A gobbled up her pancake and asked for a second. Success! Moments of enthusiasm about food are few and far between. 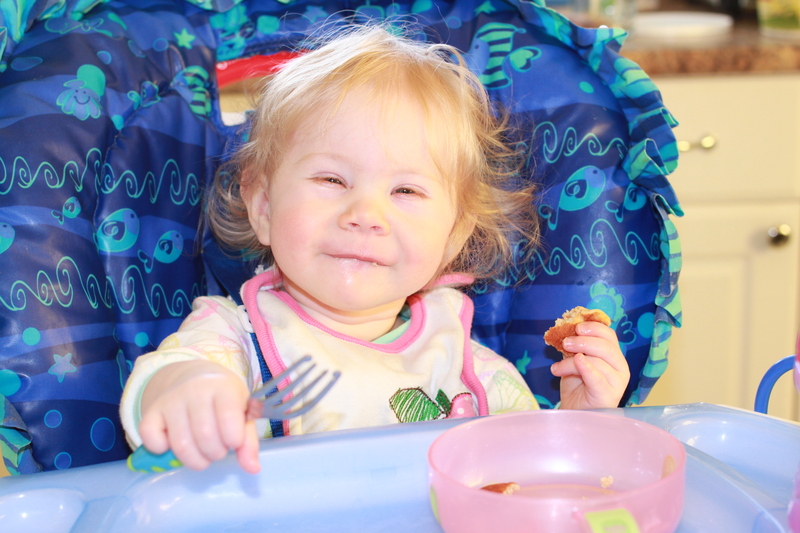 This entry was posted in Food and Nutrition and tagged baby cereal pancakes, baby finger foods, homemade baby food on February 22, 2014 by lovelaughlaundry.